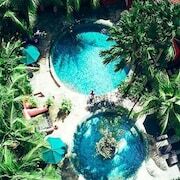 Situated on the waterfront, this luxury hotel is within 1 mi (2 km) of Bingin Beach and Padang Padang Beach. Blue Point Beach and New Kuta Golf are also within 3 mi (5 km). Situated near the beach, this luxury resort is within a 10-minute walk of Uluwatu and Bingin Beach. Padang Padang Beach is 1 mi (1.6 km) away. This family-friendly Pecatu hotel is located in the mountains, within 1 mi (2 km) of New Kuta Golf, Balangan Beach, and Bingin Beach. Uluwatu is 1.9 mi (3.1 km) away. 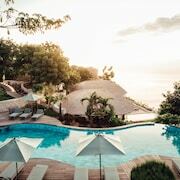 This family-friendly Pecatu hotel is located by the ocean, within 3 mi (5 km) of Uluwatu and Bingin Beach. Nyang Nyang Beach is 2.4 mi (3.9 km) away. 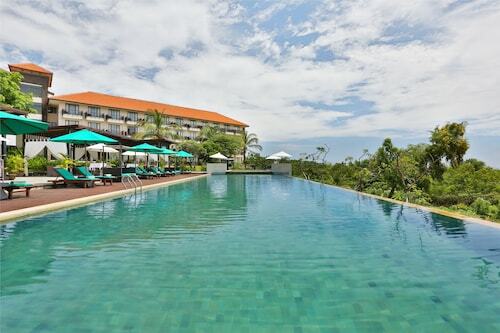 Situated near the beach, this spa hotel is steps from Padang Padang Beach and Uluwatu. Uluwatu Temple and Uluwatu Beach are also within 3 mi (5 km). Situated by the sea, this spa resort is 2.4 mi (3.9 km) from Bingin Beach and within 9 mi (15 km) of Balangan Beach and Uluwatu Beach. Nusa Dua Beach and Tuban Beach are also within 12 mi (20 km). 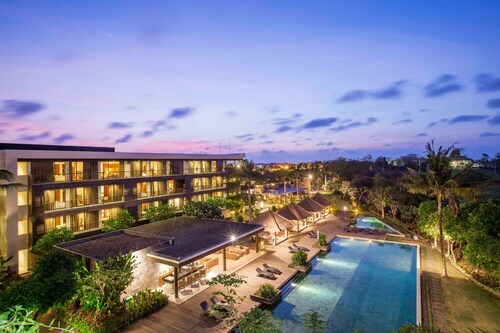 Situated in Pecatu, this golf resort is within a 10-minute walk of Uluwatu and Bingin Beach. Padang Padang Beach is 0.7 mi (1.1 km) away. 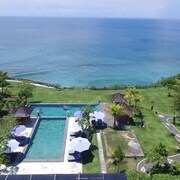 Situated by the ocean, this hotel is within 1 mi (2 km) of Padang Beach, Uluwatu, and Padang Padang Beach. Uluwatu Temple and Uluwatu Beach are also within 2 mi (3 km). 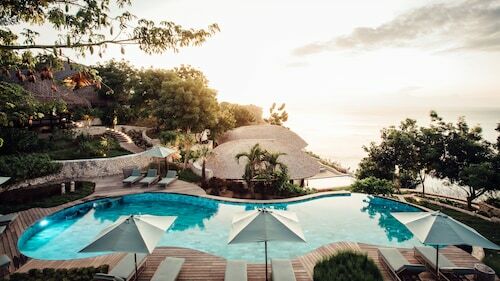 Set upon a limestone cliff, overlooking the ocean in Bali, Alila Villas Uluwatu is located 8 km (4.9 miles) from Garuda Wisnu Kencana, and 10 km (6.2 miles) from Jimbaran Bay. 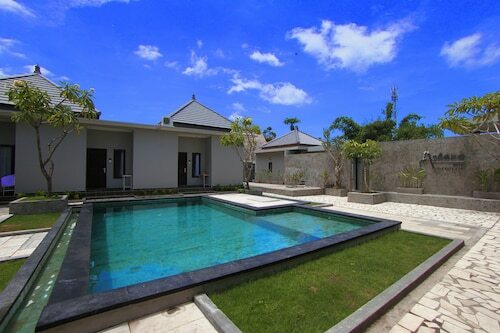 Situated in Pecatu, this luxury villa is within 3 mi (5 km) of Uluwatu, Padang Padang Beach, and Bingin Beach. Melasti Beach is 3.1 mi (5 km) away. 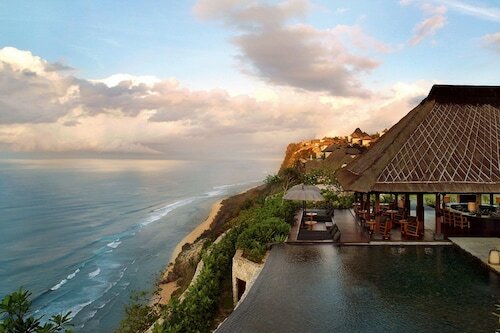 This Bali resort is 150 meters above the ocean, between a cliff and a 1.5-km private beach. 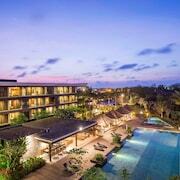 The Jimbaran Bay and international airport are 20 km north of the resort, while Kuta is a 40-minute drive. On holiday in Bali? Take the time to swing through and visit the Pecatu part of town, situated 50 kilometres south of the town centre. The Tanah Lot and Kuta Beach put Bali firmly on the map and are one of the main reasons to visit. Grab your mates and have a few rounds at New Kuta Golf. 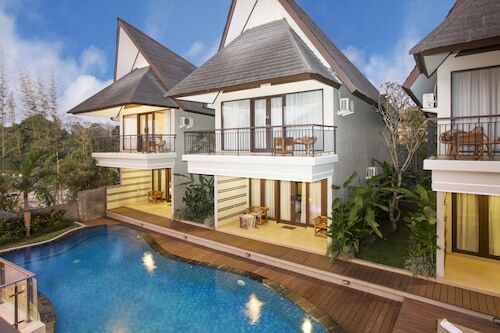 If you'd like to sleep close by, check the rates at the C151 Luxury Villas Dreamland and AYANA Resort and Spa BALI. Relax as you soak in the sights of the shore at Bingin Beach. 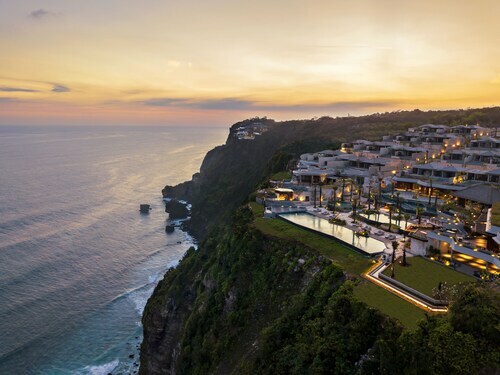 Consider the Anantara Uluwatu Bali Resort and RIMBA Jimbaran BALI by AYANA to be within easy reach of this site. 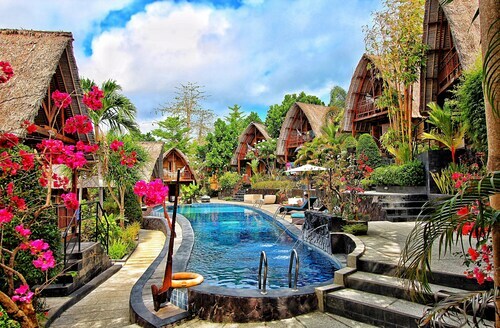 The Bingin Inn and Bali Green Hills are among the most affordable bases in Pecatu. 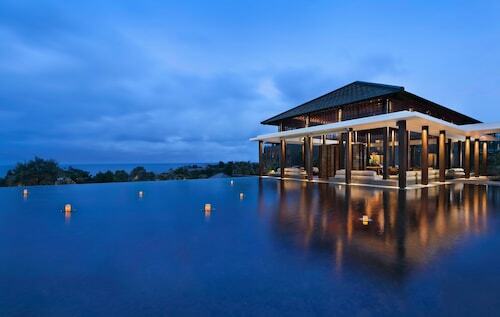 The Bulgari Resort Bali and The Edge Bali are a couple of upmarket places to sleep in Pecatu. That said, don't stress if you're travelling on a budget, because Pecatu contains a decent range of accommodation options for all travellers. A terrific Pecatu cafe, Sushi ulu wasabi is definitely worth popping into. Sit back with a newspaper, snack on a piece of cake or just grab a coffee to take away. Once the caffeine wears off and your tummy starts craving something a bit more substantial, have a browse through the menu at Il Ristorante. This well-loved eatery plates up some seriously tasty meals. Ever noticed that you tend to get thirsty as the sun starts setting? A few well-deserved beers at Bar is an ideal way to finish off a long and rewarding day. It's worth considering booking a hotel in Uluwatu or Ungasan when researching your Pecatu trip. Uluwatu is 2 kilometres from Pecatu and Ungasan is about 6 kilometres away from Pecatu. There's no shortage of terrific places to lay your head in and around Pecatu. So whether you're just looking for a place to stay, or flights, car hire and activities too, Wotif has got you covered! How Much is a Hotel Room in Pecatu? Hotels in Pecatu start at AU$39 per night. Prices and availability subject to change. Additional terms may apply. Loved everything about the Radisson ! Rooms are huge, fully equipped with everything you need. The pool is huge and there’s plenty of room to have your own space. Staff are excellent. The road to the entry is quite long so highly recommend to hire a scooter from reception for quick and easy access! Scooter hire was only $10 Aus a day. Happy hour from 5pm-7 at the pool bar - and the in house Italian restaurant is delicious!! There are great cafes all along the main road. We recommend Manna and Single Fin!! There are no taxi’s in Uluwatu so best way to get around is scooter! I loved the style, I loved the features and the location. The staff were amazing, second to none! Only a short stay but will be back! Incredible rooms, views and location. Breakfast is average considering the price of accomodation.